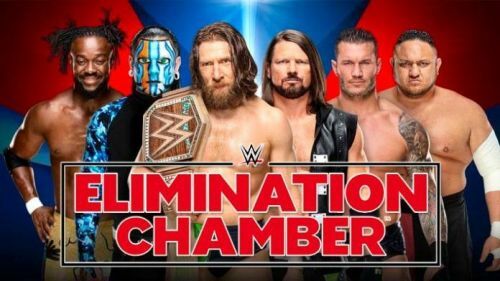 The Elimination Chamber took place on 17 February 2019, at the Toyota Center in Houston, Texas. The PPV was named after the Elimination Chamber – a match in which 6 participants compete inside a dangerous steel structure. Every Elimination Chamber PPV features at least one of its matches inside the steel structure. This year was no different. There were two Elimination Chamber matches on the card – one for the Women’s Tag Team Championship and other for the WWE Championship. This year, WWE seemed to completely overlook the PPV and were more focused on this year’s WrestleMania. Hence, a lot of the matches on the card weren’t built up properly. For example, the RAW Women’s Championship match featuring Ronda Rousey and Ruby Riott was completely overlooked. Even the Women’s Tag Team Championship wasn’t hyped up like it should’ve been considering the fact that this was a history making match. While all this affected some of the matches on the card, WWE still managed to impress. The PPV on a whole wasn’t as bad as expected and with a little bit more effort, this could’ve been a pretty awesome show. We’ve taken the time to go through all the matches on the main card and offer our ratings. Each match is rated based on various factors like longevity, excitement, predictability, and in-ring action. There was a lot of expectations surrounding this match considering that it would crown the first-ever Women’s Tag Team Champions and it exceeded all those expectations. The match itself was quite good and enjoyable. Sasha Banks and Bayley started the match against Mandy Rose and Sonya Deville. The Riott Squad entered the chamber at number 3, The IIconics entered at number 4 followed by Naomi and Carmella, and Nia Jax and Tamina. There were a couple of good spots in the match and WWE built on its already existing storyline from SmackDown Live when Naomi got a bit of sweet revenge on Mandy Rose who was trying to have an extramarital affair with Naomi’s husband – Jimmy Uso. Soon after she got her revenge, she was pinned via a double rollup from the IIconics and her team was the first team eliminated. Once Nia Jax and Tamina entered the match, they cleaned house. This resulted in the IIconics locking themselves in a pod. But Nia and Tamina broke open the pods and started swinging The IIconics against the steel chains like a pair of baseball bats. This was really fun to watch and was something we hadn’t seen before. There were a couple of traditional spots you would expect to see in an Elimination Chamber match. One such spot was when The Riott Squad climbed on top of a pod and they just jumped onto Nia Jax, Mandy Rose, and Sonya Deville. The Riott Squad were eliminated after a Samoan Drop from Nia Jax followed by a splash from Tamina. Later on in the match, Nia drove herself through the pod. This resulted in all the other participants ganging up on Tamina to eliminate them. It finally came down to the two teams that started the match. Sasha Banks and Bayley picked up the win after making Sonya Deville tap out to the Bank Statement.